Although Hisense spent much of their press conference talking about their upcoming ULED TVs, their booth at this year's CES showed off both the company's first 8K and MicroLED TVs. Hisense's 8K TV is 65-inch in size and features a similar stand design to the Series 9 ULED. CES marks the second time the display was shown off to the public. It debuted at this year's IFA. Like most of their 2019 hardware, we understand that Hisense's first 8K TV will run on their VIDAA 3 AI operating system. Hisense told us that the content being used to demonstrate the display at CES was all upscaled 4K content (since they believe that's the way that most consumers will likely be using this product in the near future) but, to our eyes, it looked visually gorgeous all the same. However, we wouldn't say it looked noticeably better or different than the other 8K TVs on offer from LG, Sony and Samsung. 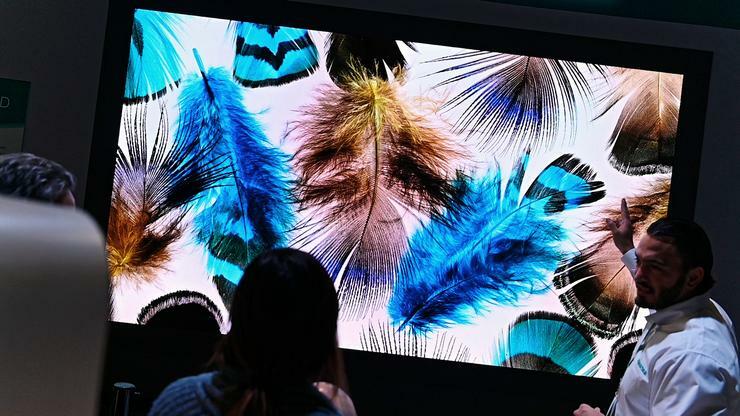 Speaking of Samsung, Hisense also brought their own MicroLED showpiece to this year's CES: a 143-inch MicroLED concept TV dubbed the Adonis MD. The company had little detail to share on the display, its specs and whether it would come to market. Nevertheless, existence of the concept product contributes to a wider narrative of innovation that Hisense seem determined to build around themselves. Right now, Hisense are a company that deals almost exclusively in LCD LED TVs. The diverse roster of tech on display at their CES booth this year suggests that might well change in the future. From their laser TVs and OLEDs to their MicroLED and ULED XD offerings, Hisense look like they're finally ready to compete on the same level as giants like LG and Samsung. Hisense told PC World Australia that they intend to bring the 8K TV to Australia in 2019 but couldn't specify when, nor how much it would cost.